Sightmark continues to expand on their line of reflex sights, and I was glad to visit their booth at SHOT Show this year. 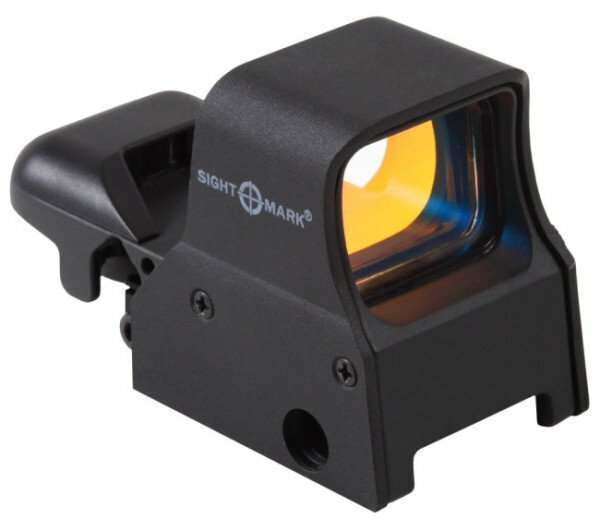 I’ll be posting articles on a couple of Sightmark’s new products in coming weeks, but I wanted to take a moment to review the Ultra Shot series of reflex sights that have been on the market for a few years now. Ultra Dual Shot Pro Spec NV QD. The new EOTech 558 reflex sight with QD lever (magnifier separate). 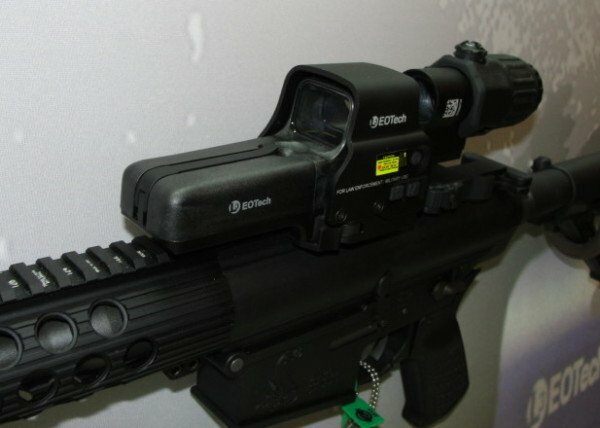 EOTech, a division of L3 Technologies, is one of the world leaders for red dot, or reflex weapons sights. The BlueSheepDog Crew has already completed an article on the EOTech 518, and now it is time to look at the new EOTech 558, night vision compatible holographic weapon sight (HWS). The EOTech 558 can be viewed as a mission-specific upgrade to the similar model 518. Virtually identical in size, shape, and function, the EOTech 558 adds the night vision capability, along with a more durable water resistance of the sight body. Both sights use AA batteries and offer the popular QD release lever. Eye Safety Systems, Inc. (ESS) was developed in 1998 with the intent of providing high quality eye protection for military, and law enforcement users. ESS has greatly expanded since then, and is currently the only approved eye pro provider for the U.S. Marine Corps, and also provides products for other U.S. DoD contracts and governments in over 100 countries. Something I just learned is that ESS is a wholly-owned subsidiary of wildly popular Oakley, Inc. The ESS Crossbow ballistic eye protection are some of the highest quality and best value eye pro available on the market today. In addition to meeting strict military and civilian ballistic protection standards, the ESS Crossbow are available at a price that is incredibly affordable for any officer or shooter that is serious about eye protection. The Trijicon 1-6x24mm VCOG was introduced a full year before this year’s flood of similar optics. 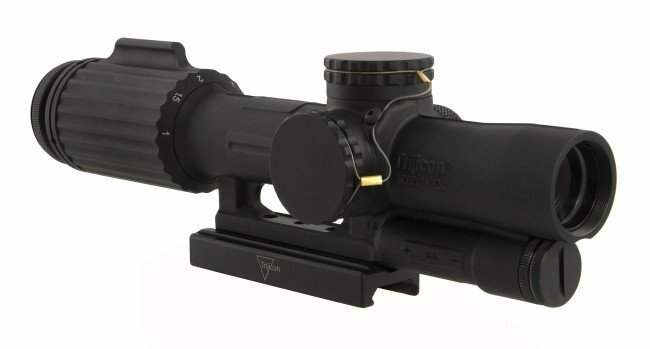 With the incredible outpouring of 1-6x24mm rifle scopes at SHOT Show this year, I thought it would be a good time to take a look back at the Trijicon VCOG, 1-6x24mm rifle scope. Trijicon beat the rush, and introduced their VCOG at the 2014 SHOT Show, a full year before this year’s offerings. Trijicon has almost become synonymous with high quality AR-15 rifle optics with their prolific ACOG used for years by the U.S. Military in the Iraq and Afghanistan wars. According to Trijicon, they wanted to combine the toughness and function of the combat-proven ACOG, into a new style of variable optic. The Trijicon VCOG (Variable Combat Optical Gunsight) is the result of that effort, offering the now very popular option of 1-6x24mm in a variable power rifle optic. 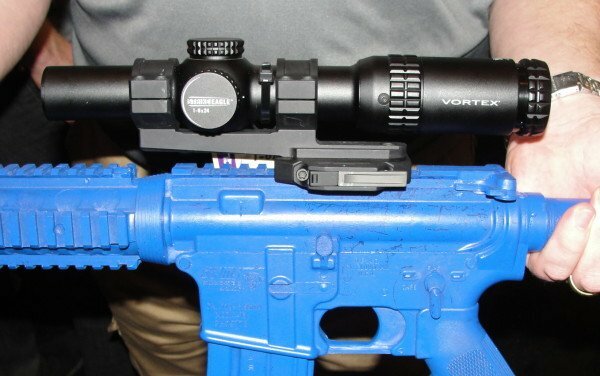 The new Vortex Strike Eagle 1-6x24mm AR-15 scope. Vortex Optics is not new to the optic business by any means, and the company continues to etch their way into a larger share of the market by making some really outstanding glass. This year at SHOT Show, Vortex revealed their new Strike Eagle 1-6x24mm reflex and magnification scope. Though targeted for the AR-15 market, the Strike Eagle has a wide open range of possibilities from bolt-action to lever rifles as well. In fact, a 1-6x magnification scope was probably the most popular product to enter the AR-15 market at this year’s SHOT Show. It seemed that nearly every major player in the optics world was coming out with their own version of a 1-6x scope, and the Vortex Strike Eagle made a strong offering. Meprolight of Israel is distributed through the Mako Group in America, and have been producing high quality accessories and optics for military, law enforcement, and civilian markets for many years. Meprolight products have proven themselves in battle during use by several units of the Israeli Defense Forces (IDF). The optics sold in America are designed to meet Mil-Spec requirements. Late last year Meprolight introduced their new Tru-Dot RDS (Red Dot Sight). The Tru-Dot RDS came from research and design that generated the Meprolight M5 light for the IDF. The IDF required several additional features that increased the price per unit. Recognizing the market potential Meprolight made the changes for the military version, but kept the Tru-Dot RDS as a U.S. civilian market offering. The Tru-Dot RDS keeps several of the M5 upgrades, while dropping some of the expensive military options. The new Leupold D-EVO dual reflex and magnification optic. During SHOT Show this year I was only able to briefly visit the Leupold booth, and in my casual look around I totally missed this gem. 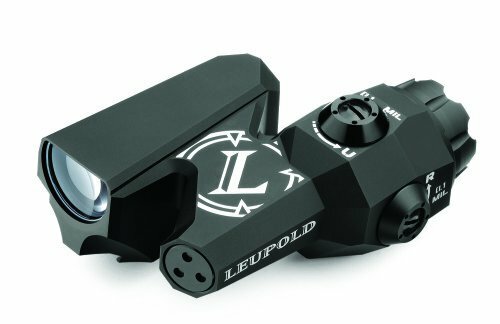 Leupold has released their D-EVO (Dual Enhanced View Optic), which is an incredible advancement in AR-15 patrol rifle optics for police officers. Obviously, the D-EVO optic has a much broader reach to competition, sport, and hunting shooters as well, but the potential benefits to police officers is significant.